For the use of biological agents by terrorists, see bioterrorism. Biological warfare (BW)—also known as germ warfare—is the use of biological toxins or infectious agents such as bacteria, viruses, and fungi with the intent to kill or incapacitate humans, animals or plants as an act of war. Biological weapons (often termed "bio-weapons", "biological threat agents", or "bio-agents") are living organisms or replicating entities (viruses, which are not universally considered "alive") that reproduce or replicate within their host victims. Entomological (insect) warfare is also considered a type of biological weapon. This type of warfare is distinct from nuclear warfare and chemical warfare, which together with biological warfare make up NBC, the military acronym for nuclear, biological, and chemical warfare using weapons of mass destruction (WMDs). None of these are conventional weapons, which are primarily due to their explosive, kinetic, or incendiary potential. Offensive biological warfare, including mass production, stockpiling and use of biological weapons, was outlawed by the 1972 Biological Weapons Convention (BWC). The rationale behind this treaty, which has been ratified or acceded to by 170 countries as of April 2013, is to prevent a biological attack which could conceivably result in large numbers of civilian casualties and cause severe disruption to economic and societal infrastructure. Many countries, including signatories of the BWC, currently pursue research into the defense or protection against BW, which is not prohibited by the BWC. As a tactical weapon for military use, a significant problem with a BW attack is that it would take days to be effective, and therefore might not immediately stop an opposing force. Some biological agents (smallpox, pneumonic plague, Mycoplasma fermentans incognitus) have the capability of person-to-person transmission via aerosolized respiratory droplets. This feature can be undesirable, as the agent(s) may be transmitted by this mechanism to unintended populations, including neutral or even friendly forces. While containment of BW is less of a concern for certain criminal or terrorist organizations, it remains a significant concern for the military and civilian populations of virtually all nations. Rudimentary forms of biological warfare have been practiced since antiquity. During the 6th century BC, the Assyrians poisoned enemy wells with a fungus that would render the enemy delirious. In 1346, the bodies of Mongol warriors of the Golden Horde who had died of plague were thrown over the walls of the besieged Crimean city of Kaffa. Specialists disagree over whether this operation may have been responsible for the spread of the Black Death into Europe. It has been claimed that the British Marines used smallpox in New South Wales in 1789. Historians have long debated inconclusively whether the British Army used smallpox in an episode against Native Americans in 1763. With the onset of World War II, the Ministry of Supply in the United Kingdom established a BW program at Porton Down, headed by the microbiologist Paul Fildes. The research was championed by Winston Churchill and soon tularemia, anthrax, brucellosis, and botulism toxins had been effectively weaponized. In particular, Gruinard Island in Scotland, during a series of extensive tests was contaminated with anthrax for the next 56 years. Although the UK never offensively used the biological weapons it developed on its own, its program was the first to successfully weaponize a variety of deadly pathogens and bring them into industrial production. When the USA entered the war, mounting British pressure for the creation of a similar research program for an Allied pooling of resources, led to the creation of a large industrial complex at Fort Detrick, Maryland in 1942 under the direction of George W. Merck. The biological and chemical weapons developed during that period were tested at the Dugway Proving Grounds in Utah. 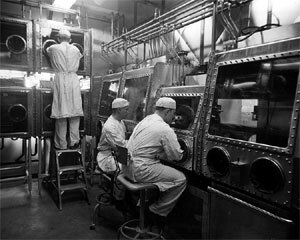 Soon there were facilities for the mass production of anthrax spores, brucellosis, and botulism toxins, although the war was over before these weapons could be of much operational use. In 1969, the UK and the Warsaw Pact, separately, introduced proposals to the UN to ban biological weapons, and US President Richard Nixon terminated production of biological weapons, allowing only scientific research for defensive measures. The Biological and Toxin Weapons Convention was signed by the US, UK, USSR and other nations, as a ban on "development, production and stockpiling of microbes or their poisonous products except in amounts necessary for protective and peaceful research" in 1972. However, the Soviet Union continued research and production of massive offensive biological weapons in a program called Biopreparat, despite having signed the convention. By 2011, 165 countries had signed the treaty and none are proven—though nine are still suspected—to possess offensive BW programs. For example, Bacillus anthracis is considered an effective agent for several reasons. First, it forms hardy spores, perfect for dispersal aerosols. Second, this organism is not considered transmissible from person to person, and thus rarely if ever causes secondary infections. A pulmonary anthrax infection starts with ordinary influenza-like symptoms and progresses to a lethal hemorrhagic mediastinitis within 3–7 days, with a fatality rate that is 90% or higher in untreated patients. Finally, friendly personnel can be protected with suitable antibiotics. A large-scale attack using anthrax would require the creation of aerosol particles of 1.5 to 5 µm: larger particles would not reach the lower respiratory tract, while smaller particles would be exhaled back out into the atmosphere. At this size, conductive powders tend to aggregate because of electrostatic charges, hindering dispersion. So the material must be treated to insulate and neutralize the charges. The weaponized agent must be resistant to degradation by rain and ultraviolet radiation from sunlight, while retaining the ability to efficiently infect the human lung. There are other technological difficulties as well, chiefly relating to storage of the weaponized agent. Attacking animals is another area of biological warfare intended to eliminate animal resources for transportation and food. In the First World War, German agents were arrested attempting to inoculate draft animals with anthrax, and they were believed to be responsible for outbreaks of glanders in horses and mules. The British tainted small feed cakes with anthrax in the Second World War as a potential means of attacking German cattle for food denial, but never employed the weapon. In the 1950s, the United States had a field trial with hog cholera. During the Mau Mau Uprising in 1952, the poisonous latex of the African milk bush was used to kill cattle. Outside the context of war, humans have deliberately introduced the rabbit disease Myxomatosis, originating in South America, to Australia and Europe, with the intention of reducing the rabbit population – which had devastating but temporary results, with wild rabbit populations reduced to a fraction of their former size but survivors developing immunity and increasing again. It is important to note that all classical and modern biological weapons organisms can be obtained from plants and animal who are infected with the diseases, one of the exceptions is, commonly known, smallpox. Indeed, in the largest biological weapons accident known– the anthrax outbreak in Sverdlovsk (now Yekaterinburg) in the Soviet Union in 1979, sheep became ill with anthrax as far as 200 kilometers from the release point of the organism from a military facility in the southeastern portion of the city and still off limits to visitors today, see Sverdlovsk Anthrax leak). 1. Single cause of a certain disease caused by an uncommon agent, with lack of an epidemiological explanation. 2. Unusual, rare, genetically engineered strain of an agent. 3. High morbidity and mortality rates in regards to patients with the same or similar symptoms. 4. Unusual presentation of the disease. 5. Unusual geographic or seasonal distribution. 6. Stable endemic disease, but with an unexplained increase in relevance. 7. Rare transmission (aerosols, food, water). 8. No illness presented in people who were/are not exposed to "common ventilation systems (have separate closed ventilation systems) when illness is seen in persons in close proximity who have a common ventilation system." 9. Different and unexplained diseases coexisting in the same patient without any other explanation. 10. Rare illness that affects a large, disparate population (respiratory disease might suggest the pathogen or agent was inhaled). 11. Illness is unusual for a certain population or age-group in which it takes presence. 12. Unusual trends of death and/or illness in animal populations, previous to or accompanying illness in humans. 13. Many effected reaching out for treatment at the same time. 14. Similar genetic makeup of agents in effected individuals. 15. Simultaneous collections of similar illness in non-contiguous areas, domestic, or foreign. 16. An abundance of cases of unexplained diseases and deaths. ↑ Gray, Colin. (2007). Another Bloody Century: Future Warfare. Page 265 to 266. Phoenix. ISBN 0-304-36734-6. ↑ "Informaworld link". http://www.informaworld.com/smpp/content~content=a714004040&db=all. Retrieved 24 October 2014. ↑ Wheelis, Mark (2002). "Biological warfare at the 1346 siege of Caffa". Center for Disease Control. pp. 971–5. Digital object identifier:10.3201/eid0809.010536. PMC 2732530. PMID 12194776. http://www.cdc.gov/ncidod/EID/vol8no9/01-0536.htm. ↑ Barras, Vincent; Greub, Gilbert (2014). "History of biological warfare and bioterrorism". pp. 497–502. Digital object identifier:10.1111/1469-0691.12706. ↑ Andrew G. Robertson, and Laura J. Robertson. "From asps to allegations: biological warfare in history," Military medicine (1995) 160#8 pp: 369-373. ↑ Christopher, Warren (2013). "Smallpox at Sydney Cove - Who, When, Why". Digital object identifier:10.1080/14443058.2013.849750#preview. See also History of biological warfare#New South Wales, First Fleet#First Fleet smallpox, and History wars#Controversy over smallpox in Australia. ↑ Fenn, Elizabeth A.. "Biological Warfare in Eighteenth-Century North America: Beyond Jeffery Amherst". pp. 1552–1580. Digital object identifier:10.2307/2567577. JSTOR 2567577. ↑ Koenig, Robert (2006), The Fourth Horseman: One Man's Secret Campaign to Fight the Great War in America, PublicAffairs. ↑ Prasad, S.K. (2009). Biological Agents, Volume 2. Discovery Publishing House. p. 36. ISBN 9788183563819. https://books.google.com/?id=SoDwO-dl-i0C. ↑ Guillemin, J (2006). "Scientists and the history of biological weapons: A brief historical overview of the development of biological weapons in the twentieth century". pp. S45–S49. Digital object identifier:10.1038/sj.embor.7400689. PMC 1490304. PMID 16819450. ↑ Barenblatt, Daniel (2004). "A Plague upon Humanity". HarperCollins. pp. 220–221. ↑ "Weapons of Mass Destruction: Plague as Biological Weapons Agent". GlobalSecurity.org. http://www.globalsecurity.org/wmd/intro/bio_plague.htm. Retrieved 21 December 2014. ↑ Amy Stewart (25 April 2011). "Where To Find The World's Most 'Wicked Bugs': Fleas". National Public Radio. http://www.npr.org/2011/04/25/135638924/where-to-find-the-worlds-most-wicked-bugs. ↑ Russell Working (5 June 2001). "The trial of Unit 731". The Japan Times. http://www.japantimes.co.jp/opinion/2001/06/05/commentary/world-commentary/the-trial-of-unit-731/. ↑ Ken Alibek and K Handelman (1999), Biohazard: The Chilling True Story of the Largest Covert Biological Weapons Program in the World Trade From the Inside by the Man Who Ran It, New York, NY: Random House. ↑ 28.0 28.1 "26 Countries' WMD Programs; A Global History of WMD Use - US - Iraq War - ProCon.org". Usiraq.procon.org. 2009-05-29. http://usiraq.procon.org/view.resource.php?resourceID=000678. Retrieved 2013-09-05. ↑ "Loner Likely Sent Anthrax, FBI Says". Los Angeles Times. Archived from the original on 7 April 2008. https://web.archive.org/web/20080407193942/http://www.ph.ucla.edu/epi/bioter/lonerlikelyanthrax.html. Retrieved 30 March 2008. ↑ "Anthrax Facts | UPMC Center for Health Security". Upmc-biosecurity.org. Archived from the original on 24 July 2013. https://web.archive.org/20130724131322/http://www.upmc-biosecurity.org/website/our_work/biological-threats-and-epidemics/fact_sheets/anthrax.html. Retrieved 2013-09-05. ↑ 31.0 31.1 Kenneth Alibek and S. Handelman. Biohazard: The Chilling True Story of the Largest Covert Biological Weapons Program in the World – Told from Inside by the Man Who Ran it. 1999. Delta (2000) ISBN 0-385-33496-6 . ↑ "Potential bioweapons". pp. 1–15. Digital object identifier:10.1016/j.clim.2003.09.010. http://www.sciencedirect.com/science?_ob=ArticleURL&_udi=B6WCJ-4BVPRTS-1&_user=10&_rdoc=1&_fmt=&_orig=search&_sort=d&view=c&_acct=C000050221&_version=1&_urlVersion=0&_userid=10&md5=853a10899e7fadf68b3c6fd459fa2b4a. Retrieved 24 October 2014. ↑ "Vietnam's war against Agent Orange". BBC News. 14 June 2004. http://news.bbc.co.uk/1/hi/health/3798581.stm. Retrieved 17 April 2010. ↑ Lockwood, Jeffrey A. Six-legged Soldiers: Using Insects as Weapons of War, Oxford University Press, USA, 2008, pp. 9–26, (ISBN 0195333055). ↑ Ouagrham-Gormley S. Dissuading Biological Weapons Proliferation. Contemporary Security Policy [serial online]. December 2013;34(3):473-500. Available from: Humanities International Complete, Ipswich, MA. Accessed 28 January 2015. ↑ 40.0 40.1 Wilkening D. Modeling the incubation period of inhalational anthrax. Medical Decision Making [serial online]. 1 July 2008;28(4):593-605. Available from: Scopus®, Ipswich, MA. Accessed 28 January 2015. ↑ Toth D, Gundlapalli A, Adler F, et al. Quantitative Models of the Dose-Response and Time Course of Inhalational Anthrax in Humans. Plos Pathogens [serial online]. August 2013;9(8):1-18. Available from: Academic Search Complete, Ipswich, MA. Accessed 28 January 2015. ↑ Treadwell, Tracee (March–April 2003). "Epidemiological Clues to Bioterrorism". pp. 93–94. Digital object identifier:10.1093/phr/118.2.92. ↑ "Physorg.com, "Encoded Metallic Nanowires Reveal Bioweapons", 12:50 EST, 10 August 2006.". http://www.physorg.com/news74433040.html. Retrieved 24 October 2014. ↑ "BiosparQ features". http://www.tno.nl/content.cfm?context=markten&content=case&laag1=178&item_id=832. Retrieved 24 October 2014. ↑ Garfinkel, M., Endy, D., Epstein, G., and Friedman, R. (2007). In Synthetic Genomics: Options for Governance. Available at: http://www.jcvi.org/cms/research/projects/syngen-options/overview/. ↑ National Security Advisory Board on Biotechnology (NSABB) (2010). Addressing Biosecurity Concerns Related to Synthetic Biology. Available at: http://oba.od.nih.gov/biosecurity/pdf/NSABB%20SynBio%20-DRAFT%20Report-FINAL%20(2)_6-7-10.pdf. Retrieved 4 September 2010. ↑ Cello, J.; Paul, A. V.; Wimmer, E. (2002). "Chemical synthesis of poliovirus cDNA: generation of infectious virus in the absence of natural template". pp. 1016–1018. Digital object identifier:10.1126/science.1072266. PMID 12114528. ↑ Wimmer, E.; Mueller, S.; Tumpey, T. M.; Taubenberger, J. K. (2009). "Synthetic viruses: a new opportunity to understand and prevent viral disease". pp. 1163–1172. Digital object identifier:10.1038/nbt.1593. PMC 2819212. PMID 20010599. ↑ 54.0 54.1 54.2 Basulto, Dominic (2015-11-04). "Everything you need to know about why CRISPR is such a hot technology" (in en-US). ISSN 0190-8286. https://www.washingtonpost.com/news/innovations/wp/2015/11/04/everything-you-need-to-know-about-why-crispr-is-such-a-hot-technology/. ↑ Kahn, Jennifer (2015-11-09). "The Crispr Quandary". ISSN 0362-4331. http://www.nytimes.com/2015/11/15/magazine/the-crispr-quandary.html. ↑ "CRISPR, the disruptor". http://www.nature.com/news/crispr-the-disruptor-1.17673. ↑ "Interview: Dr Kanatjan Alibekov". Frontline. PBS. http://www.pbs.org/wgbh/pages/frontline/shows/plague/interviews/alibekov.html. Retrieved 8 March 2010. ↑ "Dr. Ira Baldwin: Biological Weapons Pioneer". American History. http://www.historynet.com/dr-ira-baldwin-biological-weapons-pioneer.htm. Retrieved 8 March 2009. ↑ Leyendecker, B.; Klapp, F. (1989). "Human hepatitis experiments in the 2d World War". pp. 756–760. PMID 2698560. ↑ Maksel, Rebecca (14 January 2007). "An American waged germ warfare against U.S. in WWI". SF Gate. http://articles.sfgate.com/2007-01-14/books/17227292_1_anton-dilger-german-great-war. Retrieved 7 March 2010. ↑ "Obituary: Vladimir Pasechnik". The Daily Telegraph. London. 29 November 2001. http://www.telegraph.co.uk/news/obituaries/1363752/Vladimir-Pasechnik.html. Retrieved 8 March 2010. ↑ "Anthrax attacks". Newsnight. BBC. 14 March 2002. http://news.bbc.co.uk/1/hi/programmes/newsnight/archive/1873368.stm. Retrieved 16 March 2010. ↑ "Interviews With Biowarriors: Sergei Popov", (2001) NOVA Online. ↑ "US welcomes 'Dr Germ' capture". BBC. 13 May 2003. http://news.bbc.co.uk/1/hi/world/middle_east/3021981.stm. Retrieved 8 March 2010. ↑ "Jamie Bisher, "Baron von Rosen's 1916 Anthrax Mission," 2014". Baron von Rosen's 1916 Anthrax Mission. http://anthrax1916.weebly.com. Retrieved 24 October 2014. ↑ "MIT Security Studies Program (SSP): Jeanne Guillemin". MIT. http://web.mit.edu/ssp/people/guillemin/fellow_guillemin.html. Retrieved 8 March 2010. ↑ Lewis, Paul (4 September 2002). "Sheldon Harris, 74, Historian Of Japan's Biological Warfare". The New York Times. 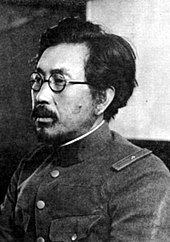 http://www.nytimes.com/2002/09/04/us/sheldon-harris-74-historian-of-japan-s-biological-warfare.html?pagewanted=1. Retrieved 8 March 2010. ↑ Miller, Judith (2001). Biological Weapons and America's Secret War. New York: Simon & Schuster. p. 67. ISBN 0-684-87158-0. ↑ "Matthew Meselson – Harvard – Belfer Center for Science and International Affairs". Harvard. http://belfercenter.ksg.harvard.edu/experts/148/matthew_meselson.html. Retrieved 8 March 2010. Chevrier, Marie Isabelle; Chomiczewski, Krzysztof; Garrigue, Henri, eds (2004). The Implementation of Legally Binding Measures to Strengthen the Biological and Toxin Weapons Convention: Proceedings of the NATO Advanced Study Institute, Held in Budapest, Hungary, 2001. Volume 150 of NATO science series: Mathematics, physics, and chemistry (illustrated ed.). Springer. ISBN 140202097X. https://books.google.com/books?id=lILltXBTo8oC&printsec=frontcover&source=gbs_ge_summary_r&cad=0#v=onepage&q&f=false. Retrieved 10 March 2014. Croddy, Eric A.; Wirtz, James J., eds (2005). Weapons of Mass Destruction. Jeffrey A. Larsen, Managing Editor. ABC-CLIO. ISBN 1851094903. https://books.google.com/books?id=ZzlNgS70OHAC&printsec=frontcover&source=gbs_ge_summary_r&cad=0#v=onepage&q&f=false. Retrieved 10 March 2014. Appel, J. M. Is all fair in biological warfare? The controversy over genetically engineered biological weapons, Journal of Medical Ethics, Volume 35, pp. 429–432 (2009). Dembek, Zygmunt (editor), Medical Aspects of Biological Warfare; Washington, DC: Borden Institute (2007). Fenn, Elizabeth A. (2000). "Biological Warfare in Eighteenth-Century North America: Beyond Jeffery Amherst". pp. 1552–1580. Digital object identifier:10.2307/2567577. JSTOR 2567577. Maskiell, Michelle, and Adrienne Mayor. "Killer Khilats: Legends of Poisoned Robes of Honour in India. Parts 1 & 2." Folklore [London] 112 (Spring and Fall 2001): 23–45, 163–82. Mayor, Adrienne, Greek Fire, Poison Arrows & Scorpion Bombs: Biological and Chemical Warfare in the Ancient World. Overlook, 2003, rev. ed. 2009. ISBN 1-58567-348-X. Preston, Richard (2002), The Demon in the Freezer, New York: Random House. Rózsa, Lajos (2009). "The motivation for biological aggression is an inherent and common aspect of the human behavioural repertoire" (PDF). pp. 217–219. Digital object identifier:10.1016/j.mehy.2008.06.047. http://www.zoologia.hu/list/motivation.pdf. Warner, Jerry; Ramsbotham, James; Tunia, Ewelina; Vadez, James J. (May 2011). Analysis of the Threat of Genetically Modified Organisms for Biological Warfare. Washington, DC: National Defense University. http://purl.fdlp.gov/GPO/gpo55844. Retrieved 8 March 2015. Woods, Lt Col Jon B. (ed. ), USAMRIID’s Medical Management of Biological Casualties Handbook, 6th edition, U.S. Army Medical Institute of Infectious Diseases, Fort Detrick, Maryland (April 2005). "Biological Warfare". National Library of Medicine. http://sis.nlm.nih.gov/enviro/biologicalwarfare.html. Retrieved 2013-05-28.